We have the perfect venue for your wedding, party, or business event. Not only is our setting beautiful, but our building has been designed with amenities that will delight event planners, caterers, and the mother of the bride. From elegant receptions for more than 1500 guests to intimate fireside dining for 50, The Jefferson offers distinctive event spaces overlooking an eight acre lake. Our 18,000 SF venue includes a 7,200 SF column-free Grand Hall along with two additional large rooms suitable for wedding ceremonies, receptions, formals, or parties. The Jefferson takes its name from the fictional town in many William Faulkner novels and short stories. Contact us for a tour of Oxford's premier event venue. 1 catering kitchen & 1 kitchen with Elizabeth Heiskell Catering in residence. West Kitchen is available to approved caterers. Our venue is a spacious 18,000 square foot building. You can relax knowing that your event will have the space that you need to spread out, dine, dance and have fun. The Grand Hall is 7,200 square feet of column-free space. The room includes a large bar area, permanent stage, bench seating along 2 walls, and views of the lake. 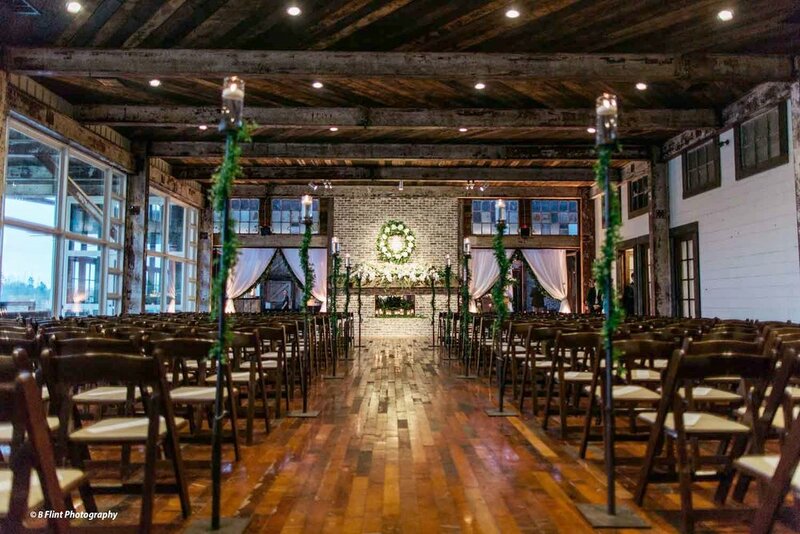 The Lakeside room is perfect for a cocktail party or an indoor ceremony with a focal point fireplace and a wall of windows overlooking the covered porch and lake.